Utilizing sentiment measures in one's analysis is not an exact science. On the other hand, at their extremes, these sentiment measures do provide signals of a potential near term change in market and economic direction. A number of 'investor sentiment' measures are available to evaluate, but I am highlighting only two below, the NAAIM Exposure Index and the American Association of Individual Investors (AAII) Sentiment Survey. 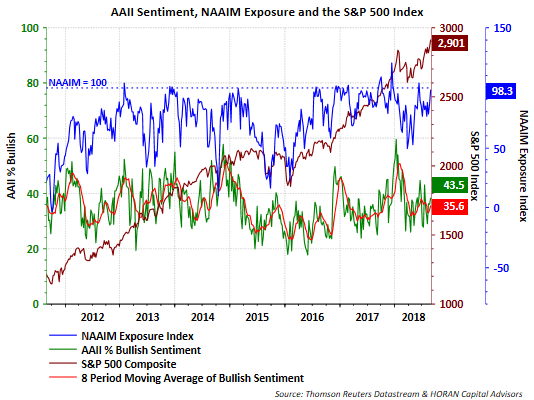 As the below chart shows, the NAAIM Exposure Index reading of 98.3% is approaching overly bullish sentiment on the part of institutional active managers. Reflecting the individual investor sentiment is the green line on the chart showing AAII's percent bullish reading and it is trending higher at 43.5%, but not at an extreme. High readings for this measure are generally at levels near 50% bullish or higher. "The most important detail in the August report is a notable decline in those saying jobs are currently hard to get which is down very steeply from an already thin 14.8% to 12.7%. This is extremely favorable for this reading and is certain to raise expectations for a very healthy monthly employment report for August. "A second detail that speaks to impressive strength is the outlook on income. Optimists here rose a very sharp 5.1 percentage points to 25.5 percent with pessimists shrinking 2.4 points to 7.0 percent. The gain here not only reflects the strength of the labor market but also the strength of the stock market." "The dominating weakness was related to less favorable assessments of buying conditions, mainly due to less favorable perceptions of market prices and to a lesser extent, rising interest rates. Future income and job certainty have become the main reasons cited by consumers for their positive spending views. This shift from attractive prices and interest rates to income is typical of the later stages of expansions, with references to income and job certainty peaking just before downturns [emphasis added]. "Although a higher inflation rate is partly due to the potential for increased tariffs, the main cause has been the expectation of robust economic growth. Luckily, consumers have not yet judged the current rate of inflation as a significant source of erosion in their living standards or as a cause to reduce their buying plans." If consumers reduce buying plans due to the belief inflation is resulting in prices of goods that are too expensive, it is this shift within sentiment that can result in a change in the direction of the economy towards a slowdown as consumers account for nearly 70% of economic activity. 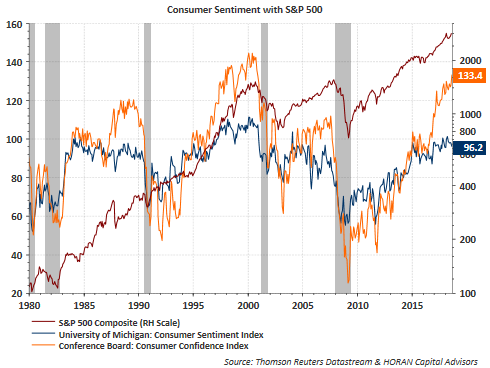 Not surprisingly, as seen on the above chart, sentiment tends to peak prior to economic slowdowns. With current U of M sentiment approaching pre-2000 levels, this is a variable investors should keep an eye on. Sentiment is only one variable and many other data points continue to project favorable economic growth near term.